The Ironman H-Class 510 Indoor Training Cycle has a lot to live up to. Seeing as it comes from a brand that is associated with images of excellence, endurance, champions and more. With Ironman in the name there are a lot expectations built in to the bike and in our review we examine whether it makes the grade. quality basis for cardio workouts for whatever your fitness goals are. Whether they are for moderate exercise to get into shape or for those wanting intense cardio workouts for training or spinning to move up another level of conditioning. In completing the review I’ve spent time reading the manufacturers site, the owner’s manual and asked questions of the manufacturers to get a full understanding of specifications and features to see how the bike meets the requirements of people wanting a spin bike for home use. To start with I looked at how tough the bike is in standing up to moderate and tough workouts. The bike is constructed from steel to give a good stable riding experience. There should be no wobbling or shaking experienced if you’ve tightened up properly. This is the case no matter how hard you are training or spinning when you are in the saddle or out of it. The bike will hold steady when you are jumping or moving between standing and seating. The 44 lbs flywheel helps to give a fluid riding motion by pulling the pedals through the pedaling cycle. This stops any choppiness when pedaling that can happen with a lighter flywheel. This provides a smooth low impact workout. The bike has 4 stabilizer feet under the stabilizer bars that can be used to level out the bike if it is being used on an uneven surface. You simply turn them until there is no rocking from side to side of bike. As the bike is newly released there is not any real data on how it stands up to real world use. The manufacturer has tested it and they found it durable. They also have given a lifetime warranty on the frame. The bike certainly looks like it will be durable and give trouble free workouts for years to come. The bike caters for people between the heights of 5ft and 6 ft 4 ins. The bike can be quickly adjusted for different heights making it suitable for multi-users in a family. It is fully adjustable with the seat and handlebars able to be moved in 4 directions – up and down, forward and backwards. The height adjustment is done by loosening the pull-pin knobs and sliding the bar into place and tightening the knobs up again. The poles have pre-set holes that you need to use to hold the seat and handlebars in place. There are makings on the pole to help with adjusting the bike back into place if it has been moved since you last used it. The horizontal adjustment uses a slider and can be micro-adjusted to exactly where you want it. This all give you a good range to get the bike to fit you properly and be comfortable for an effective workout. This avoids being cramped up or over-stretching in particular getting your alignment of your leg properly set helps to get the most best position for the best workout and also help in avoiding injury. The bike uses a leather pad to provide friction resistance that sits on the top of the flywheel. To change the resistance you turn the tension knob at the top of the frame to loosen or tighten the pad on to the flywheel. The set up is similar to most spin bikes using friction resistance. You may hear a shushing sound from the pad as the flywheel turns but it is fairly quiet and unlikely to disturb you as you cycle. Only bikes with magnetic resistance will be quieter but these bikes do cost more. (See Ironman H-Class 520 for an example). As it uses friction the pad will wear down with use. The pads normally last up to 12 months before they need replacing. When they need replacing you can source them from the supplier. The adjustment goes from easy to hard and gives a constant amount of resistance. You may find that you only need to make small adjustment to increase the resistance to the level you want. It is incremental but sensitive. 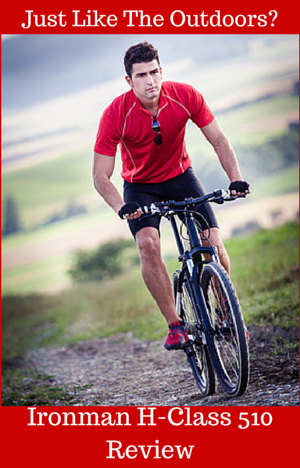 You can use it to ride against a wide range of resistance levels for hill workouts of varying difficulty. There are no markings to let you know how hard you have set the resistance which does make it difficult to know how hard you are working compared to a previous workout or returning to a previous setting. This is normal for spin bikes and indoor cycles. The Ironman H-Class 510 Indoor Training Cycle uses a chain drive for turning the flywheel which is similar to the one you find on a road bike. It gives you the same riding feel as that too. It does also come with the same requirements to maintain and makes the same amount of noise. The maintenance that is required is to lubricate and tighten as required. This is going to be less than a road bike as you won’t be spraying it with dirt and water as you get when riding a bike outside. The noise isn’t too bad it is just a soft clinking noise as the chain moves over the sprockets. The sound is muffled a little by the chain guard too. The chain guard is there to protect the chain from being damaged by sweat dropping on it but it also protects your ankle and clothes from getting caught up in the drive. The bike has a fixed gear which means when the flywheel is moving so are the pedals and vice versa. The weight of the flywheel keeps it moving after you stop pedaling so you need to be careful when stopping that you do this slowly or use the emergency brake to avoid injuring yourself. If you aren’t used to spin bikes this takes a little getting used to but it is the way most of them work. In fact the only bike I’ve reviewed to date that doesn’t used a fixed gear is the Schwinn AC Sport where you push back on the pedals and it releases them from the gear. It is an excellent bike but it costs more and doesn’t come with a computer as standard. The bike has standard bike pedals with toe baskets and straps. These fit normal athletic shoes which you slip into the basket and tighten the straps to give a good grip on the pedals. Your feet shouldn’t slip when you are pushing or pulling through the pedal cycle. The pedals are made from steel so you should have no problems standing on them and there is likely to be any sideways movement or flexing to worry about. The bike doesn’t take standard size bike pedals so you won’t be able to swap them for your favorite pedals. Noise. It isn’t a silent bike but it is quiet. You’ll hear a quiet shushing sound from the resistance pad and low clinking noise from the chain. You may need to turn up the TV slightly to hear it. Anyone in the next room is unlikely to hear the bike. It is unlikely to disturb anyone if you use it in the middle of the night, except for the lightest sleepers. You should also be able to workout during a child’s naptime if you get the chance. Dust And Dirt. The bike is fairly clean but it will drop dust from the resistance pad and lubricant on to the floor. Sweat is likely to drop too as you workout. The mat provided should protect your floor from any damage. The bike itself will need to have a quick clean to keep it from getting damaged from sweat. Handlebars. The handlebars are coated for a better grip when your hands get sweaty and preventing blisters. It does provide a little padding but you are likely to find it isn’t enough if you are leaning on them for a long period of time with your forearms. You can grip the handlebars in the different positions for spinning and training. This includes in the center, at shoulder width apart, at the ends and in the aero position. Riding Position. You ride this bike like you would a road bike by sitting upright and leaning forwards onto the handlebars. If you have a back problem this might not be the best bike for you and one of the exercise bike types maybe better way to get your exercise. Even though it is a stable bike it is quite compact making it good for storing out of the way when not in use. The bike’s footprint is 48 ins by 20 ins so it can be stored against a wall or under the stairs easily. To help in moving the bike it has 2 transport wheels on the front stabilizer bar that you tip the bike onto. They take most of the 121 lbs weight of the bike leaving you to navigate the bike to where you want it to go. A little care does need to be taken to ensure you don’t lose your balance which can happen although most of the weight is low down so it has low center of gravity helps to prevent this. It should move easily over most surfaces including carpet due to wheels being exposed so there is little for the carpet pile to get caught in. If you have wooden floor it is a good idea to check that moving the bike doesn’t scratch or dent it. The hardest part of the assembly is likely to be managing the weight of it when putting on the stabilizer bars. The shipping weight is 145 lbs and the assembled weight is 121 lbs. For this reason it is a good idea for there to be 2 of you so you don’t damage the bike or even worse injure yourself. Aside from the weight it is straightforward with everything needed for the assembly included and easy to find. It does come partially assembled with you needing only to complete the job. To complete the assembly you need to remove the protection bars then attach the stabilizer bars, water bottle holder, pedals, adjustment poles, seat, handlebars and install the computer. In installing the computer there is no feeding of wires needed to be done just attaching to handlebars and plugging the wires in to the bike. The listing and the video for the product says that the console measures watts but on checking through the manual it doesn’t actually do this. It does measure RPM, speed, time, distance, calories and pulse. The display is well positioned for viewing at the front of the bike but maybe a little hard to see in poor lighting as it doesn’t appear to have a backlight. The screen can display all the numbers at once. It starts up when you start pedaling and you can have it just monitor and count the numbers for you or you can set targets for time, distance, calories and pulse. For time, distance and calories it counts backwards until it reaches zero For the pulse rate the computer beeps when target heart rate is reached. You can set the display to scan through the values every 6 seconds , see all number displayed or just see a single value. It has 4 buttons under the screen to program in settings including targets and for testing your heart recovery rate. If you want to monitor your heart rate you need to place your hands on the pulse sensors on the handlebars. This does mean you need to ride with your hands constantly in the same position if you want to see your heart rate at all times which is a bit of inconvenience. If you want you can pair it with a heart rate strap but you need to supply this. It is compatible with 5.0KHz frequency heart straps. any uncoded straps should work but Uncoded Polar chest belts or uncoded Timex Chest belts will work. They need to be uncoded as some are coded to work with a prticular machine. The computer uses 2 AAA batteries to power it which are included. The information on the console is not stored from a workout and it can’t be uploaded to an App or account. If you want to track progress this needs to be done manually in a spreadsheet or journal. There aren’t that many bikes that offer you this with the nearest bike in terms of price being the Ironman H-Class 520 giving you that functionality but costing about $300 more currently but it does come with premium features including magnetic resistance and belt drive. There are limited accessories included with the bike which is normal for spin bikes in this price range. It comes with a rubber mat and a water bottle holder. The bottle holder is on the right fork of the bike which makes it easy to reach. You slide your water bottle in and out of it which might make it a little awkward to get it in if you are pedaling at any pace. The mat included is something more than you get with other bikes. It helps to stop the bike damaging your floor if it moves or when sweat or lubricant drop down. It does not include anywhere to plug in a MP3 player or somewhere to rest a book or tablet. The operator manual lets you know how to assemble, how to change the resistance, how to adjust seat and handlebar height and position and has warm up information. There is little on how to set the bike in the correct position or how to get the most out of the bike. As it is their level entry bike I’d have expected a little more guidance for beginners but fortunately there is plenty of information online that provides this information. This bike has a mid range price that comes with a good basic console, a heavy flywheel and strong construction to give the basis for workouts as tough as you want. Some of the price is paying for the brand but you are getting a bike that appears to be one that will give you trouble free workouts for a long time. There were no discounts when I checked for this bike. Amazon was offering free shipping and it qualified for Prime at the time. This bike seems to be a well built bike to give a good solid durable basis for workouts and training at whatever intensity you want. It can be used by those looking to get started and those who are more experienced. The flywheel gives the pedaling a natural riding feel for a low impact workout. The resistance is easy to apply for different terrain workouts. The bike itself is stable and seems durable to give many years of workouts. The console gives good basic information including heart rate to be able to get the most out of each workout. Unfortunately you can’t upload the information to a fitness account. Overall this appears to be a very good bike that can help you get in shape right up to training for a triathlon if you want. Do you know anything about the “exploit”? Price points? Weight limits etc.? Sorry I’m not familiar with the exploit at present but will take a look at in the future when I have time.